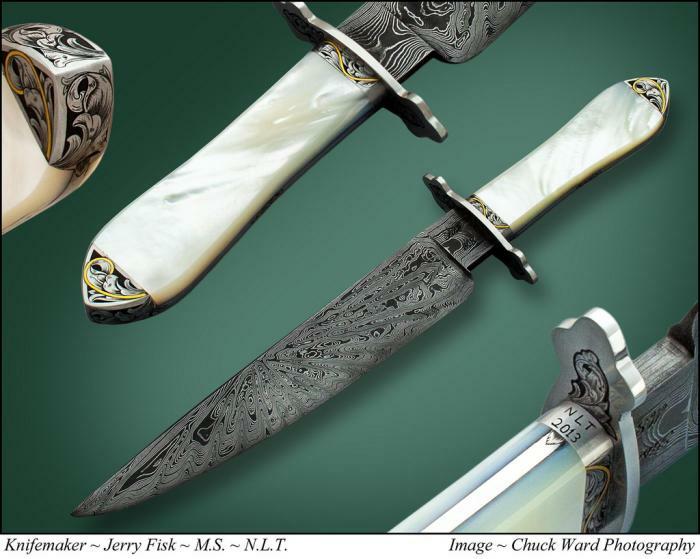 THIS KNIFE WAS FROM THE 2013 SHOW, I LEFT IT UP SO YOU CAN SEE WHAT SOME OF THE PIECES AT THE SHOW MIGHT LOOK LIKE. IT SOLD AT THE SHOW. FOR MORE INFORMATION GO TO THE MICRO SHOW BUTTON. This Mother of Pearl California style bowie is a classic. Many of the dressed up bowies used on the west coast years ago had either ivory or Mother of Pearl. As most all of you know getting Mother of Pearl this thickness is rare. I have deep relief engraving with 24kt gold inlay in the rear bolster and the ferrule. Deep relief on the top and bottom of the bolster as well as front and back of the guard. This is a classic as you can get folks and would make an outstanding center piece of a collection. It is like my grandfather told me many years ago, "A civilized man always has a Pearl handled knife."